A highly recommended website for Vietnamese propaganda posters. Soviet posters first appeared during the Proletarian Revolution in Russia - they delivered Communist Party's slogans to the masses and called on workers and peasants to fight for freedom and justice. 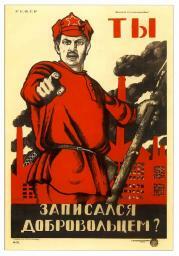 Most of us are familiar with Dmitry Moor's famous poster " Have You Enlisted In the Army?" The image of a Red Army soldier with plumes of black smoke rising from the factory smokestacks in the background, bluntly questioning the Russian worker about his contribution to the defense of the October Revolution, became the iconic piece of Soviet propaganda. 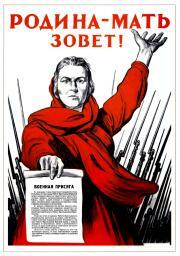 Posters took on a very important role during the October Revolution and subsequent Civil War. Very few newspapers were published in those days and often a poster replaced the tabloid. Poster art was widely accessible to the masses, the images it depicted were easily understood by everyone, and a short and energetic accompanying slogan stuck in the viewers mind, as a constant call for action. In time of Civil War, propaganda posters were sent to the front lines in the same capacity as bullets and artillery shells. They were posted on walls, in cities which were under assault by the White Guard armies and foreign interventionists. The bottom of the vivid, bright-colored poster usually contained a warning: " Anyone who tears down or covers up this poster - is committing a counter-revolutionary act ". The poster was a powerful weapon, and just like any weapon, it had to be guarded with utmost care. The most outstanding among the first revolutionary posters are the works of D.S. Moor, V.V. Mayakovsky , M.M. Cheremnykh and V.N. Deni. Each of these artists used unique methods and techniques in order to create emphatic art with powerful propaganda messages. During the Civil War, "ROSTA Windows" ("Okna ROSTA") - a famous project by the Russian Telegraph Agency, brought together artists who turned telegrams from Red Army soldiers into posters within hours of receiving them from the front lines. Renowned poet, Vladimir Mayakovsky, became the soul of this undertaking. He produced texts based on the most recent telegrams and accompanied them with sketches. Mikhail Cheremnykh was also actively engaged in the project. Soviet artists frantically produced dozens of posters overnight, and every morning "Okna ROSTA" were posted in the empty storefronts and windows (hence the project's name), informing the citizens of the latest news in vivid and sharp-witted form. Victor Deni, a superb master of political caricature of his day, introduced smashing satire to the Soviet propaganda art. His posters mercilessly ridiculed capitalists, corrupt politicians and spineless yes-man. When the "great edifice of Socialism" was being erected through the first series of Five-Year Plans, propaganda posters could be found everywhere in the USSR - they were posted on construction sites, collective farm fields, grain elevator towers and massive concrete walls of the DneproGes dam. A look back at the posters from that era creates a chronicled timeline of Soviet Union's creation and evolution. Each and every major event in the life of the Soviet people is reflected in the legacy of socialist agitprop. Just within days of the beginning of WWII, Irakli Toidze created another legendary Soviet poster, " Motherland Is Calling!" Catastrophic situation faced by the USSR during the first period of the war is well illustrated by the image of a bloody Nazi bayonet, pointed at a mother with a child in her arms standing among flames of fire in Victor Koretsky's poster "Red Army Soldier, Save Us!" 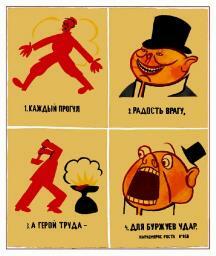 Alexei Kokorekin's poster " For Motherland! ", picturing a fatally wounded sailor throwing an anti-tank grenade in the midst of his enemies, was another powerful artwork that stirred up patriotic passions among the Soviet people. After the Red Army stopped and eventually pushed back the Germans, Victor Ivanov in his poster " We are Drinking the Water From Our Native Dnieper, Soon We Will Drink From Prut, Neman and Bug" created an image of a heroic soldier-liberator quenching his thirst by scooping up the symbolically sacred river water with a helmet. Alongside the Soviet Army, which continued to break the chains of Nazi occupation over Europe, Dementy Shmarinov's poster " Red Army Brings Liberation" entered Polish, Czech, Hungarian and Romanian cities. At the end of WWII, Leonid Golovanov commemorated the victory by drawing a poster of a triumphant Soviet soldier in Berlin, placing an inscription " We Made It!" on the walls of Reichstag. Over the period of WWII artists created thousands of posters, millions of which were reproduced and launched into circulation. Just like during the Civil War "Okna ROSTA" (renamed "Okna TASS" after the Telegraph Agency of the Soviet Union") played a very important role in motivating the nation. The distinctive style of the Soviet poster art was coined during times of war and struggle. It was always laconic, expressive and straight-forward. Even from faraway it was recognized by a person walking at a fast pace. The poster usually featured one or two figures whose actions were underlined by a characteristic movement. Clear contrast of the central figures (group) compared with the rest of the objects in the composition distinguished the best works. Eventually the artists started paying more attention to the human nature, and learned how to convey personality and emotions through facial expressions of their characters - thus making the posters more vigorous and effective. With the end of WWII, world peace and friendship among nations became the main theme of the propaganda poster. Young artists like N. Treschenko, O. Savostyuk and B. Uspensky, along with such distinguished masters of the poster art as Victor Govorkov, generated interesting and witty compositions agitating for USSR as the force of peace in the world. In the post-war period, the Soviet movie industry achieved considerable success. Famous movie-poster artists, such as V. Kononov, M. Heifitz, B. Zelensky and I. Hazanovsky refused to simply "announce" the movie releases in their work. Instead they explored artistic expression in order to reveal the film's content and essence through printed images. Works of these artists won numerous awards at international competitions. The grandiose 7-year program for the development of USSR's national economy, declared at the 21 st Communist Party Congress, required renewed efforts from the propaganda establishment and especially the poster artists. Once again, colorful and visually engaging posters motivated the enthusiasm of working masses to carry out the Party's plan in the newly established agricultural communities and on sites of glorified construction projects. Soviet posters have always kept pace with the times. They created images of role models for generations of Soviet workers and soldiers, exposed international warmongers and fought for world peace.